Sinnott Blacktop, LLC was established in 1988 as a residential paving contractor. We are a family owned business located in Duluth, Minnesota and Orlando, Fl. Our company provides quality residential and commercial asphalt paving, seal coating, and related services at reasonable rates. We ensure the superior service that you deserve – 100% satisfaction guaranteed. Sinnott Blacktop, LLC also worked 25 years with Arrowhead Blacktop, a commercial parking lot contractor. Our skilled, experienced crews excel at all phases of asphalt construction. From designing to finishing, customer satisfaction is assured on every job. We use the best materials to make certain we meet or exceed the specifications laid out for each project. 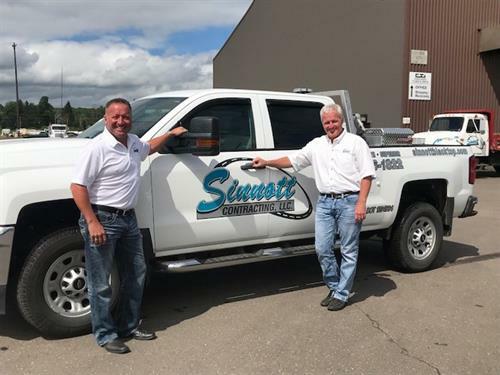 We continue to operate under the same dedicated leadership and commitment to quality first established by Bob Sinnott. As we grow, the one thing that hasn’t changed, our commitment to providing you with the best paving experience. Sinnott Blacktop, LLC looks forward to working with residential projects, general contractors, and public entities to establish long lasting relationships, and to provide a superior job experience. Thank you Sonju Two Harbors for letting us work on your parking lot! Great day of paving at Sonju Two Harbors!